Innovating Innovation. Little Changes that Will Create Innovations like the MBI, which detects Breast cancer Earlier, more Accurately and Cheaper than mammograms. Deborah Rhodes, a doctor of internal medicine, recently published an article outlining a new, extremely promising innovation in Breast Cancer Screening. Currently, the cheapest, most effective way to screen women is through a mammogram. 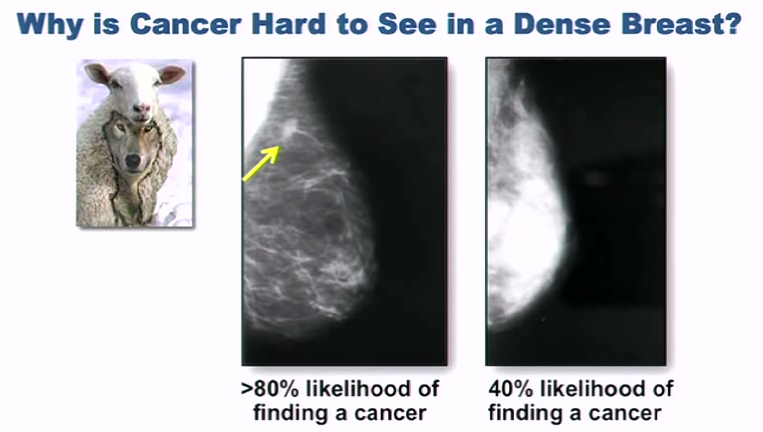 But 40% of women with dense breasts (often younger women under 49 years of age) will never have a cancer found on a mammogram until the tumour is large enough to make treatment harder, and survival rates exponentially lower. In fact, this fact alone has been proven, in a 25 year study which found that a yearly mammogramdoes not improve mortality in women aged 40 - 59! Tumours in fatty breasts (yellow arrow) are much more easily seen than in dense breasts, where tumours and the fibrous/glandy tissues that constitute dense breasts, both appear as white. Rhodes found radiology's ignoring of 40% of women disturbing, as I'm sure you do to. Her effort and passion to answer this question from a patient; "How sure are you that I don't have breast cancer?" has led to the development of a new, cheap and effective tool which uses smaller gamma detectors to pick up tumour cells, called the Molecular Breast Imager (MBI). This is likely to revolutionise breast cancer screening, and improve survival rates in women with breast Cancer by catching it early, and making sure it's done cheaply. She recently spoke about her discovery at a TED talk event, and her teams' development, along with their selfless action in not patenting, or intending to profit off this life-saving technology was received with great ovations, at the event itself and by the wider community. "The only time a physicist and doctor meet, is when a physicist gets sick." Her discovery only came into being when she and a physicist randomly met and got to talking about their respective fields. The physicist had just developed a new gamma detector, smaller and cheaper than ever before, which he was excited about, because it would make his experiments much cheaper. When he explained this development to Deborah - she saw another use for it. A use that may just end up saving your life, or your sister's, partner's or mother's. But what if she never had met this physicist? What if she had never chanced upon his article on this topic? It's very unlikely that she would have, given they're from completely separate fields of study... Even if she did, how would she know what the hell he was on about, or what that discovery could mean for others without him explaining it more to her? So that got me thinking about all the revolutionary ideas we've had in the past. And almost all of them have resulted in some accident, like in Howard Florey leaving a petri dish out which led to our first antibiotic, or through a flash of intelligence or thought, like the apple that landed on Newton's head, or from chance meetings like Deborah and that physicist. But why should we leave these innovations to chance? Why don't we foster more relationships between experts of different fields and see what we can get? It becomes apparent to me now that today, where there is so much more information and knowledge than ever before, individuals simply can't keep up with every field like the Aristotles, Gallileos and Da Vinci's of the past could. And because of all this knowledge floating around, we've HAD to become so specialised. 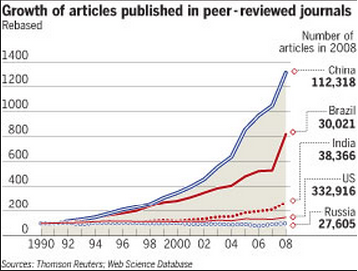 The number of research articles being publisehd every year has been increasing exponentially. It's imposible for anyone to keep up. But this has become a bit of a problem. Right now, we have leading researchers in the multitudes of fields there are in the world, who have focused in on how their research can benefit them, in their field, but not others of completely others. But the question now becomes - how do we, as society, how do experts, researchers and how do corporations, who invest in and fund innovation get more of it happening, in such a specialised world? It's not just about getting experts, or leaders in different fields to sit together in a room by the way, it's also about getting those specialised researchers, students, and laymen into the action, and creating systems which allow us to do that. We are lucky today, to have so many educated people in the world. But this means literally hundreds, sometimes even thousands of studies, papers, research and patents are done, granted or published EVERY SINGLE DAY. We need those finance experts looking at new ways of funding drug research, those biochemists developing new, cheap, green fuel and those charities funding research only focusing on 1 disease to look beyond just what their discovery does, but at what it COULD MEAN for others. Well, in my battle against cancer, I've learnt to look beyond just the obvious, glaring problems in our path, and to always see a second way of looking at things - to focus on what we can fix, rather than solely on the problems that exist. Many articles exist explaining these problems, but little is out there suggesting how to improve them. We've got to innovate on innovation. The question is, how do we do that? It becomes apparent that we need to focus our time, as a society, on not only on furthering our knowledge, but on also making sure people can understand it. But that's inefficient, you may say... That's expensive. That takes time. In truth though, you can do it easily. We're already doing some of these things right now. In truth, there's monetary benefits for companies, researchers and journals who publish and fund this research to make their studies more accessible and understandable. 1) Make studies more accessible. 2) Make them easier to understand. 3) To suggest how new developments can be applied in all fields. 4) Improve managing of Research focussed industries. 6) Encouraging anyone and everyone to innovate by showing them how. This doesn't just include making studies available to the public, by the way, though it is a big factor. Currently, subscriptions to various medical journals cost hundreds of dollars a year, and individual articles can range anywhere from $5 to hundreds for people to access. I personally know the frustration of not being able to find out more about a possible drug, one that may just be the thing which saves my life, and this pricing stops a good chunk of people who are outside the field of study from getting access to new studies and trials because they aren't part of a university program, hospital, or employed in the field they want to read up on. They have to rely on the media, which can take days, months, even years to even report on such issues, if they ever do. This stifles possible new innovations and advancements that may come from not only the public. 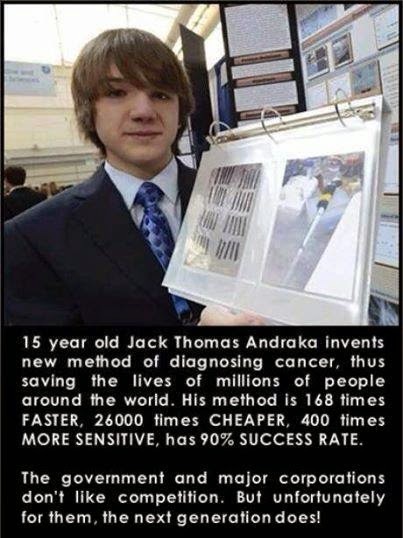 And when I say public, I don't just mean your average Joe who may have their own fresh perspective on looking at an issue or discovery, I also mean people like medical students, inventors and interested individuals, who are sometimes responsible for startling new discoveries like this high school student who developed a cheap, easy way to detect cancer early - just like Deborah Rhodes without any prior knowledge on the issue. It's understandable why Journals have to charge for their articles. Making a journal doesn't just involve getting random studies and throwing them together - vast amounts of time and money has to be spent grading papers, ensuring they're relevant, have a good amount of validity in their findings/suggestions, editing and other things to approve a study, and the fact remains, they do have to make a profit too. So they have to charge "pay per view" for them. But at the same time, it's in these journals best interests to facilitate easier access to these programs to the general public, as it would definitely increase their viewing (and therefore their advertising revenues) and also their subscription rates. Crowd sourcing, the whole concept of letting ideas flow and getting non-experts and the general public to help in innovation, is a great way of getting new ideas thought up - and NASA crowd sources a lot of its data already, by allowing people sitting at home the opportunity to find new beds of stars, track comets, observe the journey of rovers and telescopes and other cool things, saving them millions of dollars of taxpayer dollars in their budget while also entertaining those lay-people and experts alike sitting at home who are interested in the field. Who wouldn't wanna be the first person to see the latest galaxy? So how can these journals do this sustainably? One way is to reduce prices on general subscription or viewing, and supplementing this with an ad or two that you must watch before being allowed to scroll past an abstract or introduction to a paper. Maybe by selling general subscriptions to groups, such as Cancer charities - allowing access to people who REALLY need, or want to be updated on new discoveries, and also creating a market and encouraging people to get involved and subscribe to their support groups, only helping everyone along. Those are just a few of my suggestion, you tell me some of your own in the comments or on my Facebook page or wherever you saw this if you want - I really encourage it and will definitely add it in. Right now, many papers are very specific, due to the focus and deep level of understanding of experts which I mentioned before. Here's an example of an abstract - the only part available for free - on PubMed, an online sort of journal which publishes medical research- see if you can understand it. "It has been recently shown that human NK cells recognize PVR through the receptor DNAM-1, which triggers NK cell stimulation in association with beta(2) integrin. In this study, we show that NK cells recognize PVR through an additional receptor, CD96, or T cell-activated increased late expression (Tactile)." Source: http://www.ncbi.nlm.nih.gov/pubmed/15034010 <-- A very promising trial by the way highlighting a discovery of a "cancer cloaking" protein that can be exploited to make cancers more visible to your immune system in the future. Even I, after a few years of medicine and intense interest in this subject (that has extended some of my knowledge to that sometimes beyond my specilaists) in this field of blood cancers, had to look up half of those words on Wikipedia! If a regular person, or a non-expert on this field (which may be you) were to read this, why would they want to continue reading it? The fix for this is simple - just put an introduction, or background, which a vast majority of papers already do have in their full versions, along with an abstract on the "free viewing" section of internet journals. This will entice those interested in learning more and hence make them more likely to look into it, and also EDUCATE THEM on what the significance of the article is. This not only allows for more ideas to flow out, but also increases understanding and education in the public as a whole AND also benefits the journals, by creating a bigger market of people who'd be willing to pay to learn more. Again - this doesn't apply to only medical advancements - similar things happen in other online and paper articles and a whole lot of fields stand to benefit. Again, this goes back to my ideology. When conducting research that takes years to show results, it can be easy to focus in on only one issue, on only one way to use a new superconductor, on only one new receptor found on a cell or on only the benefits your invention has for your field only rather than the wider, general applications of all these products. The physicists in Deborah Rhodes' video who developed the new, smaller gamma radiation detectors only looked into how it could be used to make their own research easier, but looking at the bigger picture has created a new technology that will save MILLIONS of women from an otherwise gruesome fate. Even Rhodes herself ignores how this development can improve detection of other, hard to screen cancers! How do we fix this then? Well, some, but not all papers, have a section called the 'executive summary' - which is a basically a summation of what their discovery or what their trials or what their research has shown, how much it cost and, sometimes, possible ways of applying it to their field. If this could be expanded to also include possible applications outside of their own field, you'd not only create things and do research to help your own field, or your own very small specialty out, but also expand your discovery or invention (which you've patented, and probably stand to profit from by the way) to other fields and uses. You can simply do this by making researchers have a brainstorm session of possible applications of research, or do it more systematically by facilitating meetings between experts, conferences or talks like TED. As an example, if you owned a solar power business, it would benefit you intensely by discussing and presenting recent improvements to storing energy (that you've researched or patented) in a conference, as it may lead to it being used in a car which could expand your business outward. This collaboration is something that school kids do for fun already! Businesses could definitely stand to gain from these facilitated meetings of the minds. Again, crowd sourcing from other laymen or experts from other fields alike will allow this to happen more cheaply and effectively too. A comment section on the research will open up minds, and possible avenues of further research and innovation and create more applications of things you may have spent millions in research dollars developing. The best part about this is that media outlets will also have more acurate understanding, and coverage of research and innovation, as they will be able to understand the implications of specific research better. This will lead to more investment into the projects you, as a company or industry involved in research, have already discovered, more general interest from the public and possibly into further research too. Research right now is seen as a very risky development. This simple addition will fix that impression, by showing tangible benefits for research dollars invested. 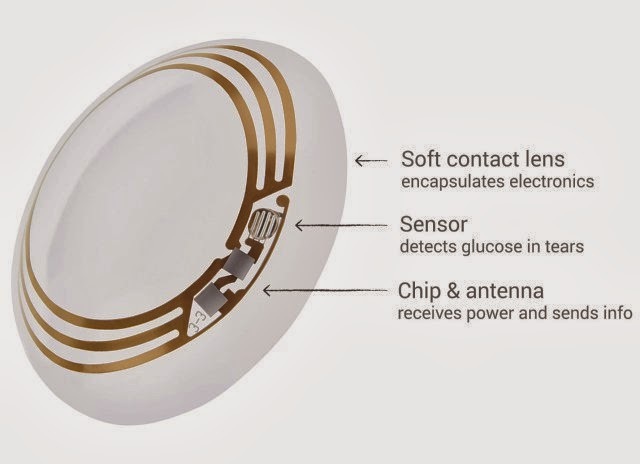 Businesses like Google - which has its own R&D department, produce new and amazing things like Google Glass, in a contact lens form which is not only awesomely cool but can also monitor glucose levels. The expansion of Google Glass's new contact lens not only entices the market of those interested in seeing the weather and Facebook literally scroll past their eyes, but also that of the 350million or so with diabetes worldwide (a number likely to grow) who will save having to prick their fingers 4 times a day! Read more about that in the link below. In the corporate world we live in, people only invest into research, development and innovation if there's a way they can benefit from it. Otherwise, why invest in it at all? There is an economic factor involved in research, something many researchers and scientists who are in it for the sake of knowledge, interest, or to help people, despise, but it's there nonetheless. There are many issues of this clash between economics and science, but without funding, unfortunately, this science couldn't happen. So again, instead of focusing only on the problems, as MANY reviews, such as this excellent one I will refer to for this section, do, at the moment, I choose to look at the solutions. This article (http://www.jci.org/articles/view/29999) talks about problems in drug development, research and innovation. I chose to look at the pharmaceutical industry not only because I'm interested in it and am writing an awesome blog post on it soon (subscribe or follow me on Facebook to see that when I finish it) but because drug development is based ALMOST SOLELY on R&D and hence is a perfect example of improvements to all innovation. The suggestions I make to improve R&D for drug companies applies to each and every research industry though, from drugs, to IT innovation to green energy research. For some context, the major problems faced by drug development is related to the rules and regulations in place, and the nature of the whole industry, which makes it an expensive, risky one. It costs 200million to fund a drug through trials, with only a 6% chance of it even getting approved, and to make up for all the losses you made on the other 94%, it's estimated that developing only ONE drug costs $4 - 11billion (and takes 10 - 15 years too). All costs you have to recover. The major problem which that article outlining problems in drug companies picked up that curbs innovation, is that research and development isn't a regular investment that can be managed as such. The money you put into research and development doesn't necessarily mean you're going to profit anything at all. As in the example of drug development, you could end up investing $200million dollars and getting nothing but failure out of it. But at the same time, you can end up making BILLIONS on a new drug, or on a new exhaust system for car manufacturing, or illuminating easier ways to conduct further research, as in the case of those physicists. But because it is a risky investment, people want to make their money go as far as possible. Therefore, sometimes, innovation is hampered, stopped or even not considered by what those funding it believe it can do. The budget of NASA, increasing and declining with worldwide phenomena such as the Cold War and financial slumps also shows how innovation can be hampered by worldwide economic phenomena. 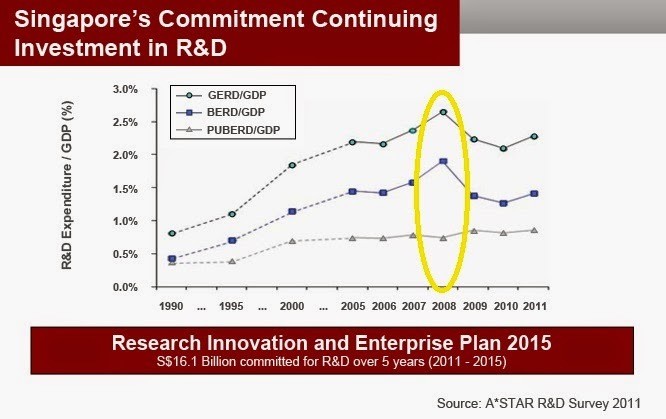 Highlighted in yellow, showing how financial decline leads to a decline in investment into R&D. This makes it more important to make all research and discoveries more efficient, which I'll give suggestions on below, and make people aware of the benefits of investing in R&D by the other steps I mentioned above. How do we fix the investment issue? Those steps I mentioned above, especially in showing the benefits and possible applications of new discoveries or research, will make research a much more attractive field - something that will attract more people willing to invest in research, and also generating more (reliable) media interest too, which involves everyone, as well as bringing in more researchers. But in the meantime, in those industries that do have R&D departments, we've got to change how we look at research. Just because R&D is an economic venture doesn't mean it should be treated as one. The article suggests that many of those in management positions "rise through the ranks by satisfying superiors and are selected by nontechnical management" which doesn't translate to getting the best out of researchers. And it makes sense. How can people who don't know the industry, which is so specialised, know which projects, which developments are the best to fund? Also, because research projects can take years, decades even to show results, there can be a loss of interest, from those who know the field or not, in projects which aren't showing any progress (even when they may just be weeks, even days away from showing results). Those who are funding the research don't always understand what the research means, or how it develops, and when pressure is put on to show results, research and development can be canned. We can improve this by getting more researchers, more innovators to be interested in management. Currently, many feel that management is just not interesting, or that it forces them to conform and hence not be able to make new innovations. Educating them on basic economic, funding, marketing and management principles not only increases interest, and makes it more likely that researchers will want to get into management more but also gets them to think of these aspects while conducting research, possibly getting them to "say the right things" - ways in which their money and funding actually helps them - to get a project approved or funded more. The best managers, and CEOs are those who understand their industry, or can learn about them. This article suggests that many researchers simply aren't able to at the moment. Again, education by the sometimes apathetic researchers, or self education by these managers needs to be fostered. The latter can be done by those measures I suggested above that makes more understandable to those who may just be laymen. There are already forums where ideas can be shared. And the internet is a big one. Social media is exciting in this, with researchers, and scientists being able to connect with eachother more easily than ever before. Facebook pages like "I F*cking Love Science", where interesting research is provided, in easy to understand language (as well as providing links to the actual studies, encouraging further learning) have taken off, and the comments on these pages, and their sites, are not only funny, but also insightful, and suggest possible further developments. Youtube is even more exciting, with ideas being spread more interactively than ever before. There are channels like Healthcare Triage, which educates regular people on how medicines and medical industries works, SciShow which gives information on recent discoveries and their possible implications and hundreds of others which educates people on discoveries and developments in a whole variety of fields. The most exciting of these, by far, is TED talks. TED stands for Technology, Entertainment and Design, and their motto is the title of this section : IDEAS WORTH SHARING. Speakers from all kinds of fields, ranging from arts to robotics to medicine to psychology, have 18 minutes to talk about new ways of looking at things, new developments in their fields and new inventions or ideas, and TEDx is a smaller scale version of that where people can talk, in that TED style about their own inventions. Indeed, TED talks is where I learnt about Deborah Rhodes and her amazing new technology, and I really recommend you watch a few videos when you can. They're not only interesting in their content, but funny and inspiring too. Bill Gates, one of many stars, on TED, talking about the need and innovations that look promising to reduce carbon emissions to 0 by 2050. There are many ways of sharing information these days, and the best thing about all the sources I mentioned above is that they not only inform us of new research and innovation, but also educate us, in easy to understand terms, what these inventions COULD MEAN. This involvement and education is something that isn't seen as often outside of the internet though. And Always Think of Solutions to Problems. Even with these new ways of spreading ideas, not everyone has that innovating mentality. Whenever I read an article, whenever I see something on the news, I immediately think of all the possible implications, from whatever angle I possibly can. More importantly, when I read about something such as horrific news stories of crimes, recent discoveries on the structure of our earth's crust and new understandings on how cancers work, I don't just read into the problems or information they convey - I think of ways to improve, or learn from them. It's exactlty what I did when I found out I had cancer. Instead of dwelling on the past on how unlucky I was to get cancer at a young age, I chose to look at what I could do to improve my condition going forward. In the cases of those articles I linked above, I think about whether past offenders, or potential offenders should be monitored by a tracking bracelet, or GPS chip rather than just have a signed AVO which doesn't stop, or at least decrease the occurrence of horrible crimes such as that talked about in that chilling article. In the second case, I immediately thought, is there any possible way for the water stored in our mantle to be used, something unlikely, or if that water plays an important role alongside the outer mantle in manipulating our earth's movements? In the case of the third, I wondered if finding a "cloaking protein" on the surface of cancer cells can be manipulated and targeted to kill off cancers, along with how newer delivery methods for drugs such as ghost bacteria or even nanobots, could make delivering drugs to tumour cells directly possible. I may have confused you there on some of them (click the links to know more about what I'm talking about and you'll understand), but thinking about the wider implications of new scientific discoveries and potentials for improving or applying them is something that not many experts are interested in. The fact is though, you have to think about the wider impact of discoveries, or treatment options - things like the economic impact, moral integrity, marketing, issues of equality and even politics in everything you do to get the best out of research. And so I will be expanding on my philosophy of always trying to get the best out of situations, and always seeing a better way of looking at things, in a later blog post, where I will, more importantly, show how anyone can do it too to get past their difficulties and to flourish beyond them. These are only a few ideas I've thought up to foster more innovation. We are becoming more and more specialised, and focused on only our field of choice these days, and that IS leading to new discoveries and research being done. But the innovative ideas - those little brain sparks - that may reduce our environmental footprint, that develop training regimes that create Olympic medalists, that create cures for cancers are just a connecting of two minds away. We can foster more innovation by making research more accessible, more understandable, more efficient and more profitable. And I hope these ideas have inspired you to think about other ways we may able to foster innovation. My next blog post will be on this very idea - applied to the Pharmaceutical Industry - and will show all the problems faced by new drug development (the high cost, high risk and long pay-off time is only the tip of the iceburg) and suggest how new innovations, new ways of thinking and new systems can improve the whole system. And included in that will be the almost novel idea that we don't always need drugs, or fancy new equipment or surgeries, to improve our health system, and how we can get our improvements to the third world too. I'll also be doing one on charity - using the "ideologies" i talked about above to show how third world development can be achieved, and why it should be considered a priority here - not just for the emotional reasons and "warm fuzzy feeling it gives" but also because development of everyone helps everyone. Hopefully it will be very interesting - do subscribe or follow me on Facebook (you must be sick of me saying this) to make sure you see them! And be sure to comment your own suggestions to improve innovation, or recent developments in your field too. Who knows... maybe there's a cure for cancer, or a solution to global warming or a million dollar baby stuck somewhere in a physics or robotics paper? I No Longer BELIEVE I'm a Patient. Why You Shouldn't Label Yourself. The other day, I was out to dinner and drinks with some friends. Amidst our casual banter about work, life and play we somehow got onto the topic of depression. It's something that's affected my friends, family and myself over my 3 years of being a patient. One of my friends said something that got to me. "Being told you're depressed gives you an excuse to not try to get better. Maybe if people who say they're depressed tried more, they wouldn't be depressed." He didn't mean to be judgmental or mean about it, in fact, he was sincerely concerned for their welfare. But it was obvious that he didn't know what depression does to you - that it saps away at your energy, your very ability to feel happiness, to the point where you don't even want to get out of bed. Someone else brought up a relative who'd been through depression and agreed with him whole heartedly. I myself tried to tell him about how depression really affects you, and talked about how I got out of it (by taking a step back, questioning what I was doing and eventually, seeing another way of looking at things, all only possible when I talked to someone about it). But he still maintained this idea that a majority of people use their depression as an excuse to not try - that it's their fault they're depressed. At first I was a little frustrated that he didn't understand the plight of the millions who live with depression. But I never take thingsor criticism personally or dismiss them outright (I talk about that here), instead I always use their criticism to try to improve myself and my ideas, and so after taking a step back and taking my own experiences and emotions out of the equation, I realised that he may have a good point. When we look at ourselves, we've programmed ourselves to look at the bad rather than the good. We label ourselves every day. We tell ourselves we're not smart enough, not good enough, not cool enough to do what we wanna do. To get into our dream course, our dream job, to try out for a first grade team or to ask that girl you like out on a date - we always use how we label ourselves as an excuse to not try. These labels are garnered by how we grew up, how we were raised and by what we believe other people think of us. But when we say that we're either smart or dumb, or that we're weak or strong or that we're hot or not, it's not always a bad thing. These labels can be useful. These labels allow people who are depressed or going through hard times to cut themselves some slack, and allow them to ACCEPT what's happening to them. And a lot of people look at themselves, and use those labels, either self-imposed or not, to improve themselves. But it's when we start to BELIEVE those labels, when we let them DEFINE us that they stop ourselves from trying to get better. Half the time though, we don't even know we're labeling ourselves. After thinking about his words, I took a step back and had a look at what I was doing, about 10 months after my transplant. I thought about where I was at objectively, without any bias, and realised that despite not having any major treatments, despite not being hospitalised in a while, I still thought of myself as a patient. That wasn't a terrible thing - acknowledging my vulnerability would make me cautious in what I'd eat, would ensure I'd take extra care in terms of hygiene, sanitation, that I'd stay away from sick people and take all these precautions which would all keep me healthy. But I realised that at the same time I WAS USING IT AS AN EXCUSE to not get fit, not want to learn, to not eat healthily, to sit around and be a slob. It was stopping me from getting better! That dinner was 2 months ago. Since then, I've resolved to improve myself. Slowly, over time, I kept reaffirming and telling myself to not label myself, to not use my cancer as an excuse, in my head. I did it slowly, by first doing little things that I was telling myself I couldn't, or shouldn't be doing, and then building up until I could do them. And today I'm proud to say that I don't believe that I'm a patient anymore. I see the value of being cautious. It ensures I have motivation to stay healthy, it allows me some leeway to take breaks when I need them, it ensures that I won't push my body too hard in my quest to regain my health, and that I'll always ask for help if I need it. I see the benefit of that label. But I'm not going to use my "being a patient" as an excuse to not push forward now. I'm no longer going to take a day off because I may have felt dizzy a few days ago, no longer not go on a run because my legs are too sore, no longer going to stop myself from going to classes because I shouldn't be around too many people UNLESS I REALLY HAVE TO. I'm not going to lie to myself anymore. It wasn't easy at first. But a change of place, a change of atmosphere, A CHANGE IN ATTITUDE really helped me get there. I started by going on a daily walk up and down a long hill, doing little bodyweight exercises like sit-ups and push-ups and helping out around the house. And I slowly built up from there. I knew that I wouldn't see results straight away, that I'd feel tired at times, and lazy at others. But I'd push through those times. Eat well, at the right times to make sure that I didn't even feel that lazy feeling. I knew that at times, I'd have to take breaks, especially when I'd be getting my treatments. But I reminded myself that I wouldn't use my sickness as an excuse to not try. I'm glad to say it's working. Because of my consistent work, because of my commitment to getting healthier and because of me not using my past as an excuse, I'm happier, healthier and fitter than I have been since being diagnosed. I'm running around, I'm going to classes, I'm playing basketball and I'm looking and feeling better than ever, since finding out that I had cancer. I've been a patient now for nearly 3 years. Today, 1 year after my 2nd Bone Marrow Transplant I no longer think of myself as one. And to those of you reading this - I hope this inspires you to stop using these labels as an excuse too. Have a look at yourself, and see what you label yourself as. If you find yourself telling yourself you're too sad, stupid depressed or weak to do what you want, do exactly what I did. Take a step back, have a look at yourself and question why those labels DEFINE YOU. If you think you're not smart enough or accomplished enough to do something, ask yourself why? No-one was born with the ability to read, to do calculus, to do propose theorems. THEY MADE THEMSELVES PEOPLE WHO COULD. If you wanna get that job, get into that course, pass that paper --> try your hardest, work smart, not hard and you can get to where you wanna go. It won't happen straight away, but if you work hard, ask the right people for help and work your way up like I did, you give yourself the best chance of doing it, don't you? If you think you're weak, or dependent, or just unable to change, take a step back, have a look at yourself and you'll realise that just telling yourself that is stopping you from trying. Instead, take small steps to improve yourself. Give it time - weeks, maybe months, and you can change yourself to become the happiest, strongest version of yourself. If you think you're depressed, and bound to stay that way, maybe, just maybe, you're making yourself more likely to be that way too. When you next are in a good mood, when you're feeling happy and able to do this; set up a system of talking to others, whether it be friends, family, a professional psychologist, and you'll give yourself the best chance of getting better. You may have had some bad things happen to you in the past, you may have grown up to be that way, you may even have some chemical imbalances that predispose you to feeling that way --> But it's only you - your perception of yourself which stops you from trying. These labels keep you grounded, they keep you realistic and they can motivate you. But if you believe them, they only pull you down. If you give it time, and put in the work, you CAN become the best version of yourself. And as I said before, if you need any help in your journey, feel free to contact me.